It’s just before midnight on Christmas Eve night. The sky is clear, and a thousand stars glimmer above. A procession of dozens of shepherds, some carrying candles, some playing fifes, led by a young lamb in a straw-filled cart decorated with red ribbons, who in turn is led by the lamb’s mother, walk up the hill to the church for Christmas Midnight Mass. The lamb is presented to the priest, who leads it to the creche, to keep company with Mary, Joseph, Baby Jesus, and all the santons (little saints). This is Christmas Eve night in Provence, France, where the two-month Christmas season is sparked with magic and laced with the enchantment of old, enduring traditions. Before attending Midnight Mass, families gather for two ceremonies – “cacho-fio” (Yule log ritual) and then for Gros Souper, or Great Supper. Before the great dinner, the oldest and youngest members of the family cut a yule log from a fruit tree, then carry it around the dining table three times before blessing it with mulled wine and burning it in the hearth. Reveillion means “awakening” or “awake”, and a reveillion dinner is one that lasts long into the night, generally until the wee morning hours. At the Christmas Eve dinner, seven fish and seafood dishes are served, along with local vegetables and seven wines. Some say that seven represents the sufferings of Mary, and some say it signifies the wounds of Christ. Before all the dishes are put out on the table together, the table is set with three tablecloths, three candles and three bowls of wheat, signifying the Holy Trinity. The wheat – St. Barbe’s wheat – has been saved from December 4, which is when the Christmas season begins. An extra place has been set at the table, for a deceased ancestor, an angel, or a beggar who may drop by. When the meal is finished and the table cleared, some people pull up the top tablecloth and tie up the ends, leaving the crumbs inside, and then place this bundle outside their door, signifying their help for those who are hungry. After Midnight Mass comes the second half of the Gros Souper – dessert. Not just one dessert, but 13, signifying Jesus and the 12 apostles at the Last Supper. There are four dishes signifying the four mendicants (religious orders that have taken a vow of poverty): Figs for the Franciscans, almonds for the Carmelites, raisins for the Dominicans and walnuts or hazelnuts for the Augustines. In addition, there are two nougats, one white and one black, signifying, some say, good and evil. Dates are included, because Jesus was from the Middle East. The remaining six desserts can be fresh or preserved cherries, pears, mandarins, apples, oranges or winter melon. And included in this dessert meal is a sweet bread made with olive oil and orange. Traditionally, any un-eaten desserts are left out for three days, for ancestors, angels, beggars, and, of course, for the family to much on! Around 4am, when everyone has eaten their fill of desserts, opened their gifts, and filled their spirits with the warmth of celebrating with loved ones, it is time to sleep. And then, up again in the morning, to prepare Christmas lunch, which is usually from noon to 4pm. Lunch may be a chestnut-filled roast turkey with lots of side dishes, or a more simple meal. People purchase all these wonderful foods at outdoor Christmas markets, which open up on December 4, the beginning of the season. These markets sell foods, gifts and santons, which are made of wood or clay, and are usually just a few inches tall. While a creche always has figurines of Mary, Joseph and Baby Jesus, the three wise men, some barn animals, and perhaps an angel or two, all the rest of the santons are townspeople – a baker, the town crier, a fisherman, and all the ordinary townspeople of 18th -19th century Provencal villages, bringing Baby Jesus their wares. 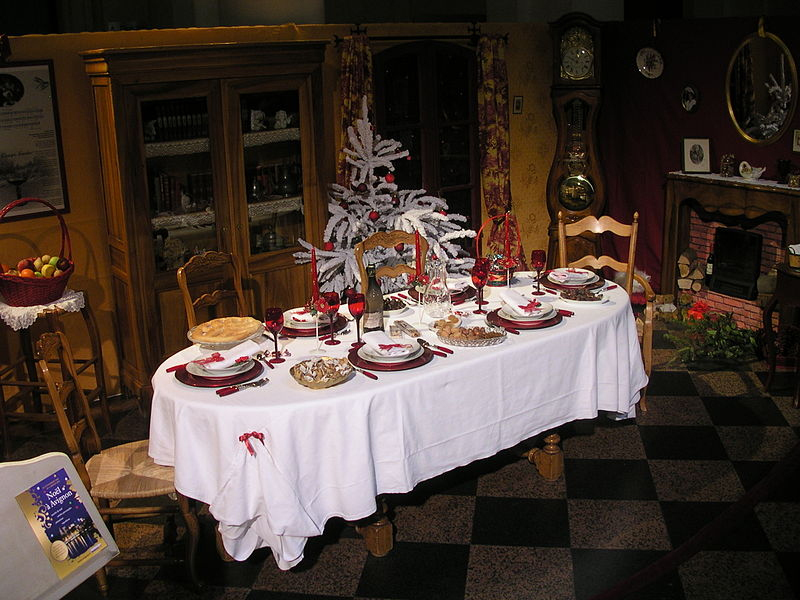 During the French Revolution, when churches were shut down and destroyed, and Christmas Midnight Mass and nativity scenes banned, the people in Provence began keeping creches in their homes, and the little santons became important in continuing Christmas traditions. Santonniers are in great demand, and the little saints can now be purchased online. 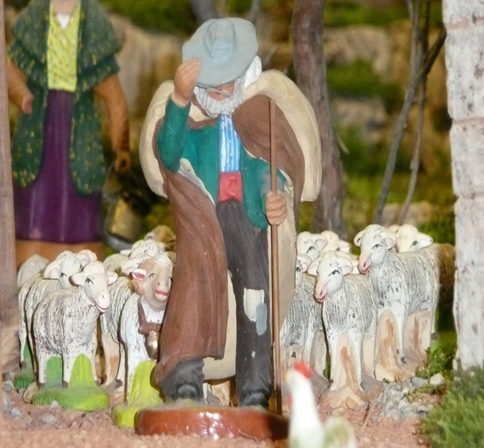 A public nativity scene may have up to 600 santons. 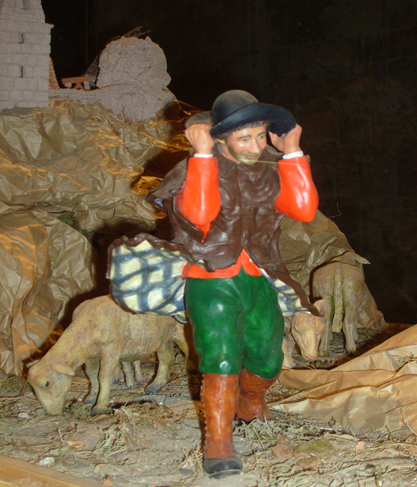 In public displays and also in private homes, it is common to move the figurines around each day, to signify the progression of the characters as they travel to the manger. Baby Jesus is put out at midnight on Christmas Day, and the three wise men, the Kings from the Orient, arrive on Epiphany, January 6. New Year’s Eve and New Year’s Day bring another reveillion, with Gros Soupers on both days. There is much eating, much drinking of wine, and boisterous merriment all around the towns. Epiphany is celebrated by serving Gateau des Rois (Kings’ Cake), which is made with candied fruit and sprinkled with sugar. Inside the cake is hidden either a santon or a bean. The person who gets the cake slice with the prize becomes the “servant”, and must perform songs and dances to entertain everyone. Families and friends gather often between New Year’s Day and Candlemas, prolonging the season with dinners, lunches and wine parties. 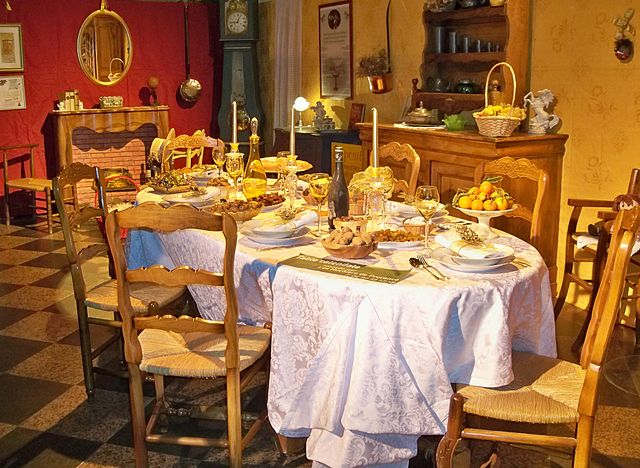 The Christmas season in Provence ends on Candlemas, on February 2. The Christmas decorations are taken down, and the santons are wrapped up carefully and tucked away for their 10-month sleep until next December 4, when they stir in their little paper wrappings, wake up, and are brought out to begin the next Christmas season. 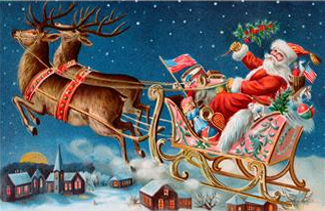 FINAL NORAD STATS, December 25, 2013: 7,060,919,100 GIFTS DELIVERED BY SANTA CLAUS! NORAD (North American Aerospace Defense Command), has been tracking Santa since 1955. And, with the internet, the tracking and reporting are even better, because you can see Santa and his reindeer flying over towns and cities in Google Earth 3D. But don’t wait until Christmas Eve to visit this website. While Santa and the elves are still making toys and preparing for the big trip, there is plenty to do on NORAD’s site. Log on now to visit the North Pole, play games and music, and watch movies. And be sure to visit the North Pole Library, where you can learn about Santa, his magic sleigh, and holiday traditions in different countries. And…for all you investigative minds out there, log onto NORAD HQ on the site to read the Secret Santa Files. How did NORAD come to track Santa each year? In 1955, A Sears store in Colorado Springs, Colorado, printed an ad with a phone number for children to call to speak with Santa. The phone number, however, was incorrect, and was the phone number to NORAD’s Commander-in-Chief’s operations hotline. Colonel Harry Shoup, Director or Operations, did not know Santa’s phone number, but he had his staff check radar for Santa’s location on Christmas Eve, and children who continued to call were given updates. A tradition was born, and NORAD does a great job with this very special mission. This site is great fun. Enjoy! December’s Full Moon is called the Full Cold Moon. It is the month when the winter cold fastens its grip and the nights become long and dark. Full Cold Moon information from The Old Farmer’s Almanac. In 2013, winter begins with the solstice at 12:11 P.M. on December 21 (EST). Get more facts about the first day of winter. LincVolt is a 1959 Lincoln Continental, owned by musician Neil Young, that was converted into a more fuel-efficient, hybrid demonstrator vehicle. Our goal is to inspire a generation by creating a clean automobile propulsion technology that serves the needs of the 21st Century and delivers performance that is a reflection of the driver’s spirit. By creating this new power technology we hope to reduce the demand for petro-fuels enough to eliminate the need for war over energy supplies, thereby enhancing the security of the USA and other nations throughout the world. We want to build a zero emissions automobile that eliminates roadside re-fueling entirely, a safe powerful automobile that is comfortable and economic on both long trips and the commute to work, an automobile that can generate power to the home when it is parked, potentially creating an income stream for the owner. It looked like a done deal, but a controversial decision by the Denver City Council that would have banned legal recreational marijuana use in public view on private property went up in smoke Monday. One of Denver’s city council members reversed his original decision on the marijuana use ordinance, citing concerns about private property rights and the enforceability of the ban which appeared poised to pass just last week. Now if the ordinance becomes law after a final vote next Monday, Denver residents will be allowed to smoke pot anywhere on their properties whether they are in their homes, in their backyards, or on their front porches in plain sight of their neighbors. If pot smokers are at someone else’s house, they would need permission from the owner of that property. 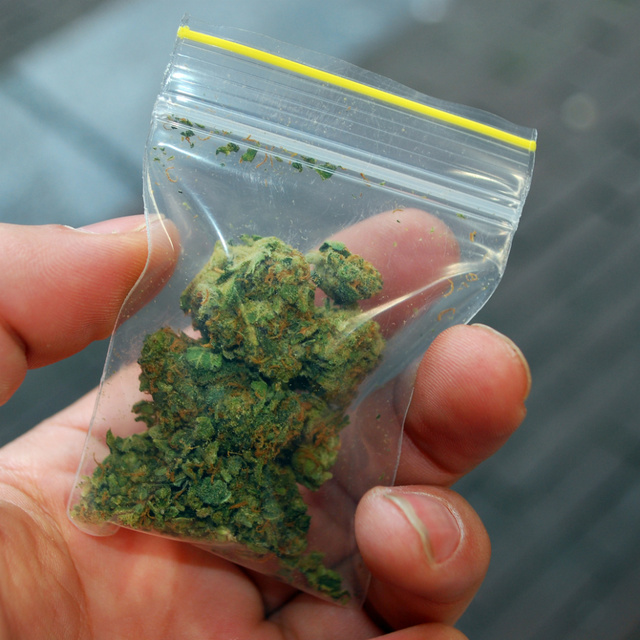 Previously, smoking marijuana in public view could have amounted to about a $1,000 fine. The sudden reversal of the front porch pot ban came as a surprise, since council members had just voted in favor of the ban last Monday and had been expected to take a final vote to make the ordinance law. With the legalization of the sale of marijuana coming into effect in Colorado on January 1st, everyone in the Centennial State has been getting ready for the bloodshot eyes of the nation to be on them. In that spirit, the Denver Post has hired a marijuana editor, and their introductory interview with him is pretty amazing. Ricardo Baca, who covered entertainment and music for the newspaper for the past twelve years, will be taking over the post. He seems pretty excited. “The short answer: I’ve covered concerts for a living over the last 15 years. That means hanging out with musicians, working with people in the industry, attending music festivals in Austin and the Coachella valley and New York and L.A. So yes. Will he share the “beat” with the other reporters in the newsroom? My colleagues who first approached me about this job told me that I will have access to reporters throughout the newsroom, and the entire staff knows that this is our biggest initiative for the coming year. Best of all, the staff wants to be involved because we’re all professional journalists and this behemoth of a story is the real deal. Will there be a marijuana critic?